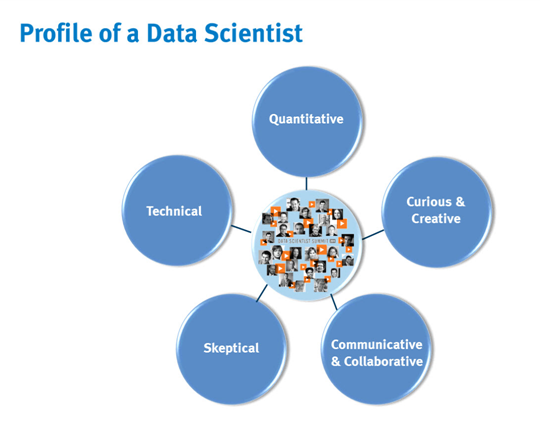 What is the Profile of a Data Scientist? At the recent EMC World event in Las Vegas, I presented a breakout session entitled “Disruptive Data Science”, which focused on how people are making the move to becoming Data Scientists. As I discussed in the session, on a basic level, Data Scientists possess and exhibit the five main qualities shown in my graphic below. Among the people I’ve spoken with, this profile of a Data Scientist really seems to be resonating. In addition to possessing the “hard skills” of being quantitative and technically focused, Data Scientists also have versatile communication and collaboration skills, and an innate curiosity for exploring and experimenting with data. They also tend to be skeptical people, in that they are likely to ask a lot of questions around the viability of a given solution and whether it will really work. These behavioral traits are what separate someone who can work with others to use data to drive change, from someone merely building an interesting algorithm in their basement. After attending the recent Data Science Summit in Las Vegas, I would say that these traits described many of the participants. The range of speakers was striking, spanning leading academic institutions that have thought leadership in Data Science (such as UC Berkeley @joehellerstein; Rice @hadleywickham; Stanford @jure; and Columbia @chrishwiggins), Data Scientists who have driven innovation in sports (@tarekkamil) and health care (@johnbrownstein), and others who are masters at telling stories with data (@jjhnumber27 and his site http://www.wefeelfine.org/). These people exemplify how these skills and behavioral traits together have the power to drive change and innovation across many disciplines. In a brief EMCTV segment, I talked about my experience developing EMC’s Data Science course, the typical traits of Data Scientists, and people who seem to be coming out of the woodwork to change their careers and realign themselves toward careers in data science. In my next post, I’ll highlight 2-3 typical profiles of people who are making the transition toward data science and steps they are taking to get there. Do you agree with this list of Data Scientist traits, or see other additional characteristics as critical? Let me know in the comments section. You could describe the main Data Scientist traits, but I think that there is one more. In my opinion the most important characteristic. One that includes the other five, I´m talking about the capability to associate and relate things that apparently have nothing to do. That is the genesis of new ideas and concepts,by the hand of Data Scientists. Excelent article. Waiting to read your next post. Thanks ! Excellent point, and yes, I agree. This is typically what I call “lateral thinking” – the ability to see across multiple domain areas or connect disparate pieces to come up with new ideas. It is this sort of thinking that enables people to invent new things, and draw innovations from one field or problem and apply it to another. If you are interested in examples of this, consider someone like James Burke, who did the book and TV series “Connections” and wrote books like the “Pinball Effect” (or “The Pinball Effect: How Renaissance Water Gardens Made the Carburetor Possible – and Other Journeys”) , in which he traced ideas that occur in different fields across centuries, and discussed innovations in one area leading to others in completely different areas. This is part of the thinking that is required of good Data Scientists in order to combine expertise from quantitative fields and technology and apply them in creative yet meaningful ways to practical problems. Thanks for the comment and for pointing this out. Pingback: Which to trust: the algorithm or intuition?